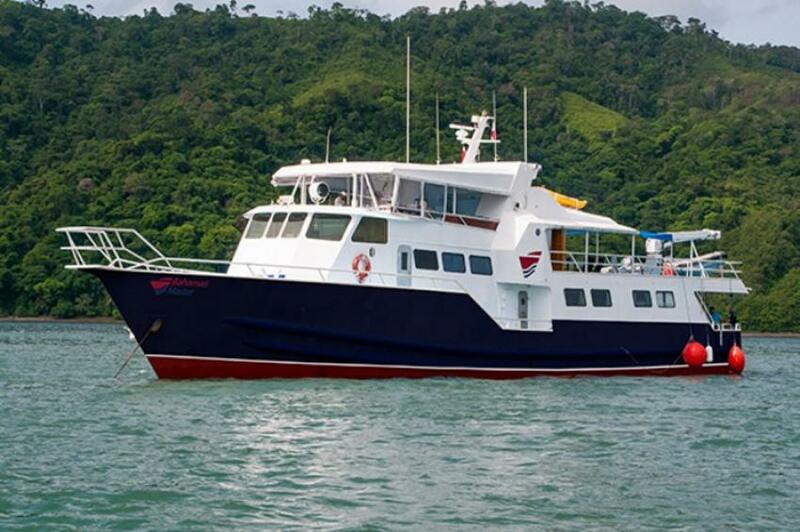 Bahamas Master - a new member of Master Liveaboards Fleet in the Caribbean Sea. Experienced crew team will guide you to the best and the most recognized Bahamas dive spots where you can meet famous Bahamas shark, dive on wrecks and blue holes. There are 9 cabins on the board of Bahamas Master. Two of them placed on the main deck. These master staterooms have double beds and air conditioning. All other rooms are on the lower deck. Two of them has private bathrooms and the other four rooms shares bathrooms. All staterooms have a panoramic view so you can enjoy an amazing view of a crystal clear blue water. Boat's salon area is located on the main deck. It’s open air and it’s perfect to observe gorgeous sceneries. A few sun loungers can be found on the main and on the top deck of the Bahamas Master. Boat’s guests can relax in the sun between dives. Dive deck of the Bahamas Master outfitted with storage boxes for the diving gear. There are 12 l tanks filled with oxygen and also an opportunity to fill in tanks with nitrox. The boat provides special equipment for photographers like camera table and storage. Bahamas Master has all necessary safety equipment like first aid kit, emergency rafts, and life vest. Bahamas Master itineraries include diving at the Tiger beach one of the most interesting destinations in the Bahamas. There is a high concentration of sharks, from tiger sharks, hammerheads, blacktips and bull sharks. Also, there are wrecks and barrier reef, the world’s third largest barrier reef, measuring 190 miles long. Diving in the Bahamas is good all year round. The average water temperature ranges from 22 C in winter and 28C in Winter (72-84°F). You will be comfortable in 3mm or 5mm wetsuit.